Can IMDb’s Ranking System Be Trusted? The Internet Movie Database — or IMDb — is one of the most-visited websites in the world, (no. 50 overall, says Alexa). Hollywood relies on it for record-keeping; industry professionals use it to check on production details or to message various film and TV workers. For that, it’s truly useful. But IMDb isn’t merely industry-facing: movie and TV-watchers use it, too. There’s even a 10-star rating system that tells IMDb what your favorites are — data they use to generate their list The IMDb Top 250 Movies. With IMDb’s 65 million registered users and industry elite crawling its pages daily, this list would seem to be an important representation of their taste. But it’s not. 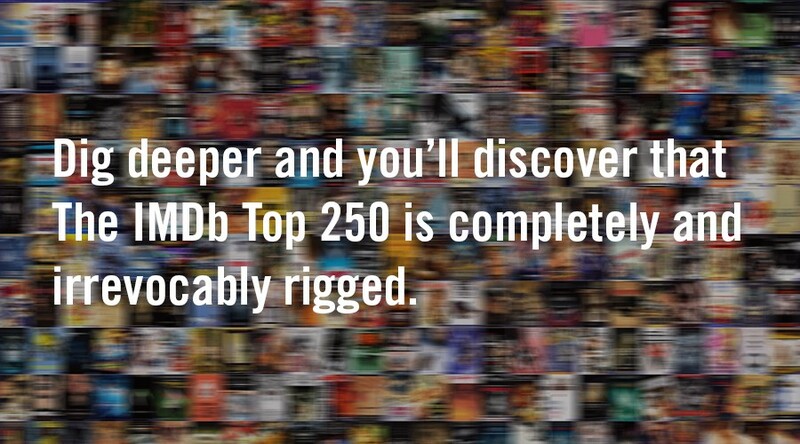 Dig deeper and you’ll discover that The IMDb Top 250 is completely and irrevocably rigged. Both IMDb and The IMDb Top 250 have roots on early-internet USENET groups — initially called rec.arts.movies, beginning in the late ’80s as a series of lists of actors, filmmakers and trivia that would be passed around by film nerds. The first post, made by a British film enthusiast named Col Needham, was called “Those eyes” and was about actresses with beautiful eyes. Within these groups, the Top 250 list emerged — and its first best movie was crowned: Star Wars: A New Hope. Over the past 25 years, the list has evolved in real time to reflect its users’ overall aggregate change in taste. If you’re wondering why the top 15 of the IMDb Top 250 is missing oft-lauded classics like Casablanca, Dr. Strangelove, Citizen Kane, Psycho, Vertigo and 2001: A Space Odyssey — we only have IMDb to blame. Their overall goal is to wring as much engagement as possible from each user, from time spent on the site to visits per day, to boost ad revenue. Thus, the secret IMDb algorithm is rigged to keep its most loyal users rewarded: your votes only count if you vote a lot. Meaning, you only get to rank a film once (on a scale of one to 10, though you can change your grade of a film at any time), and if you vote on enough movies, your grades are factored into the Top 250. But IMDb doesn’t disclose how many votes you need in order to qualify as a “regular” voter. (The FAQ says, “To maintain the effectiveness of the Top 250 Rated Charts, we deliberately do not and will not disclose the criteria used for a person to be counted as a regular voter.”) In some ways, this maintains some integrity in the Top 250, as it’s much harder to create duplicate dummy accounts and get away with ballot-stuffing. But, it also means the votes of casual fans or people who are too busy to engage as much (including the busy industry professionals who have better things to do) aren’t included in the rankings, even if they make a few of them. Like many other websites’ algorithms (anyone remember the failed Netflix algorithm challenge?) the company doesn’t want to let you know how the sausage gets made (and declined to comment for this article), creating mystery and mystique around the list and the brand. Thus, there are plenty of online threads (like here and here) dedicated to debating how the list works on a technical level. What do we know about the inner mechanics of The IMDb 250? They call their algorithm “a true Bayesian estimate,” which is a complicated system that increases the importance of the average rating the more votes are cast. IMDb is, essentially, trying to keep new movies from having artificially high ratings. That doesn’t mean they’re succeeding, which might explain why Deadpool currently has a higher ranking than Citizen Kane — no joke. IMDb voters see things differently. The list “represents diversity in movies which award shows like the Oscars, Golden Globes, BAFTA don’t have,” says 24-year old Khaled Kalache from Algeria — who votes enough to make it fair to assume that he counts as a “regular” IMDb voter. Jonny Coleman is a Los Angeles-based writer. He recently reported on Tijuana’s cultural renaissance.